Good skin and good scales are the keys to culinary success as Dan bakes a whole salmon in a salt crust. Looking much like a snow sculpture, the salmon is encased in sea salt that acts as an insulating layer to protect the moisture and flavour of the fish. Aspiring archaeologists will enjoy removing the cast-like salt layer and easy-to-peel skin to reveal the perfectly cooked salmon beneath. • Pre-heat the oven to 450° F (230° C). • In a large bowl combine the salt, egg whites and 1 cup (250 ml.) of water. • Quarter a lemon and place them in the gut cavity. 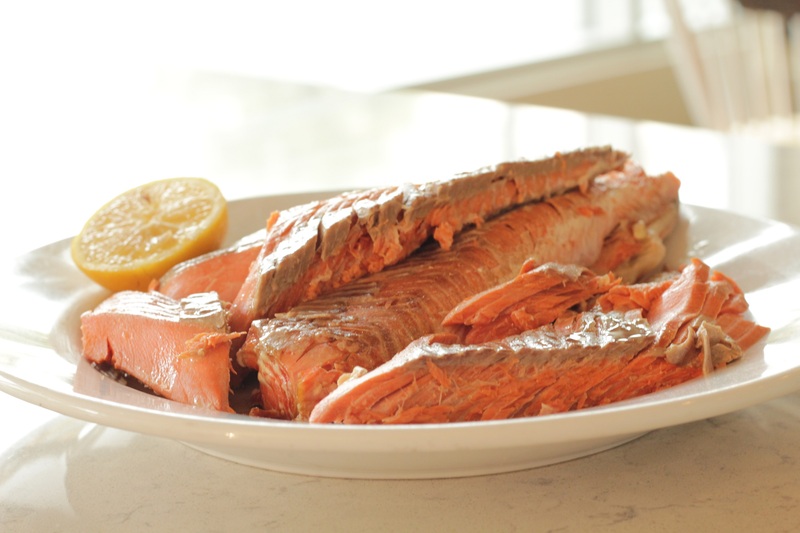 • Place a layer of salt in a large baking tray, add the salmon onto the salt and cover it with the remaining salt. Do your best to minimize the amount of salt that gets inside the fish. Sprinkle the rest of the water on top. • Place in the oven for 45 minutes (times will vary depending on the size of your fish). • Remove from the oven and let stand for 10 minutes. • Use a knife to cut along the base of the hardened salt. You should be able to pull of most of the salt in one go. Remember to do your best to not get salt inside the fish. Remove the fins and skin. The skin should come off with relative ease. Serve with lemon and some olive oil.